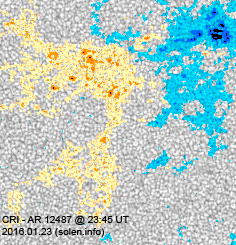 Last major update issued on January 25, 2016 at 04:25 UT. 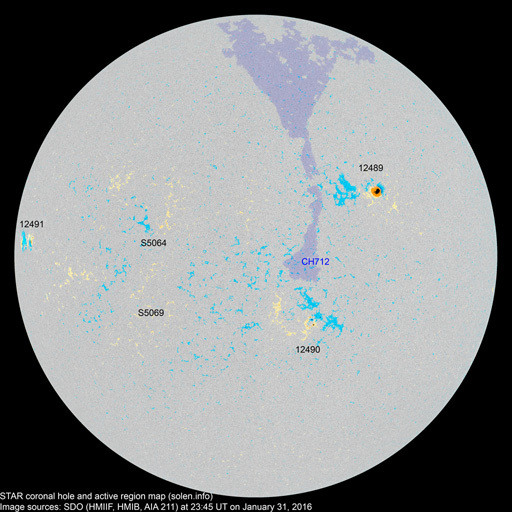 The active region section to be updated. 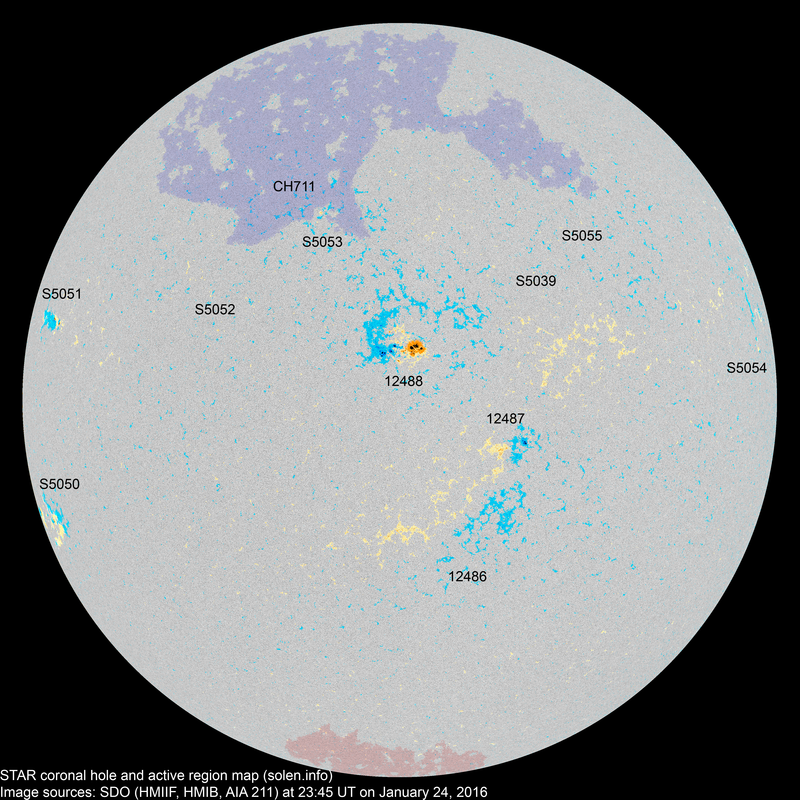 The geomagnetic field was quiet to active on January 24. 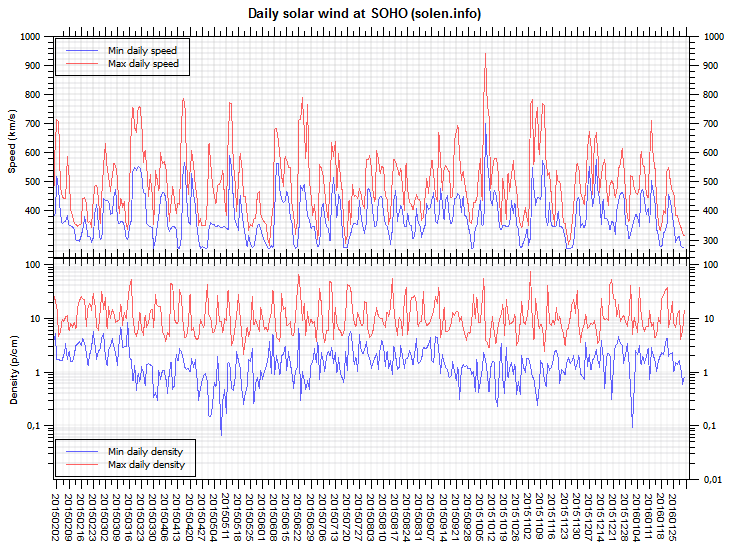 Solar wind speed at SOHO ranged between 389 and 470 km/s. The single active interval was related to a brief southward swing of the Bz component of the IMF. 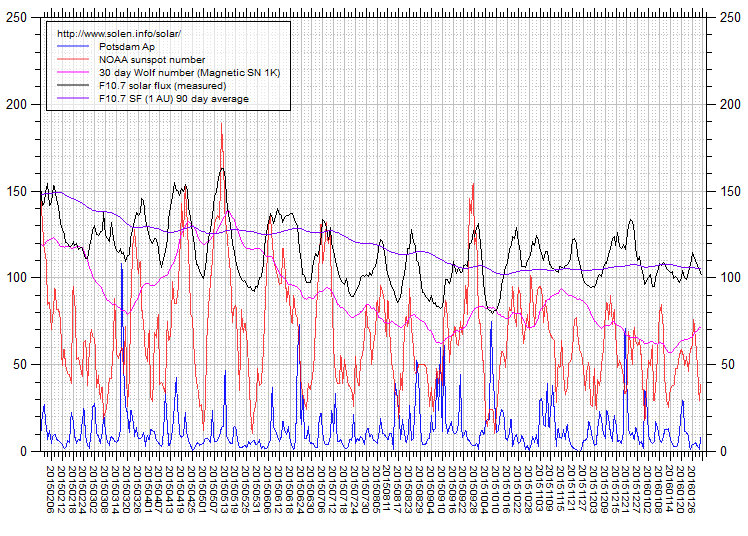 Solar flux at 20h UTC on 2.8 GHz was 103.8 (decreasing 8.3 over the last solar rotation). 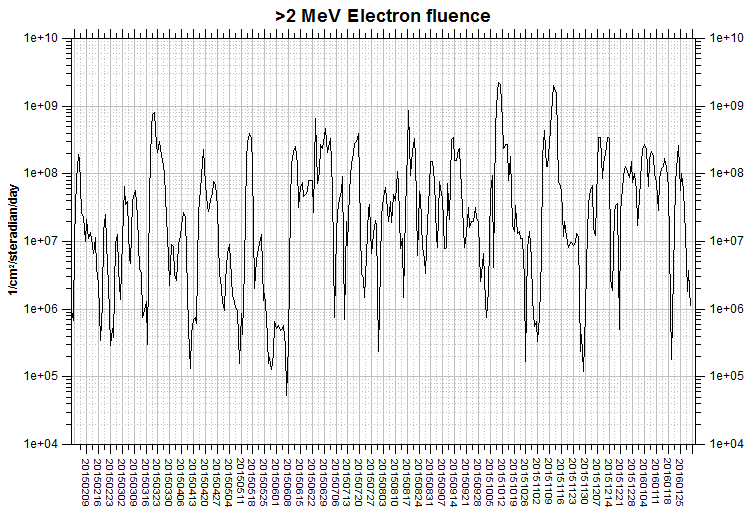 The 90 day 10.7 flux at 1 AU was 105.8. The Potsdam WDC planetary A index was 9 (STAR Ap - based on the mean of three hour interval ap indices: 8.9). 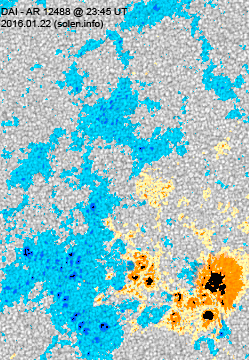 Three hour interval K indices: 32211241 (planetary), 22112342 (Boulder). 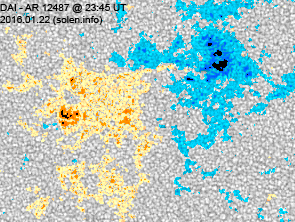 At the time of counting spots (see image time), spots were observed in 10 active regions using 2K resolution (SN: 207) and 7 active regions using 1K resolution (SN: 112) SDO images on the visible solar disk. Region 12486 [S25W10] was quiet and stable. Region 12487 [S12W18] decayed slowly and quietly. 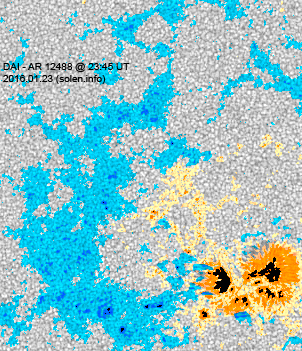 Region 12488 [N02W01] gained spots and penumbral area after noon. The region has weak polarity intermixing. S5039 [N03W27] was quiet and stable. 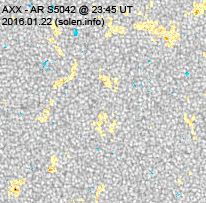 New region S5050 [S19E80] rotated into view with small spots. New region S5051 [N10E69] emerged with several spots near the northeast limb. New region S5052 [N06E28] emerged with a tiny spot. New region S5053 [N26E13] emerged near the southern edge of CH711 with tiny spots. New region S5054 [N07W74] emerged with tiny spots. New region S5055 [N17W36] emerged with a tiny spot. 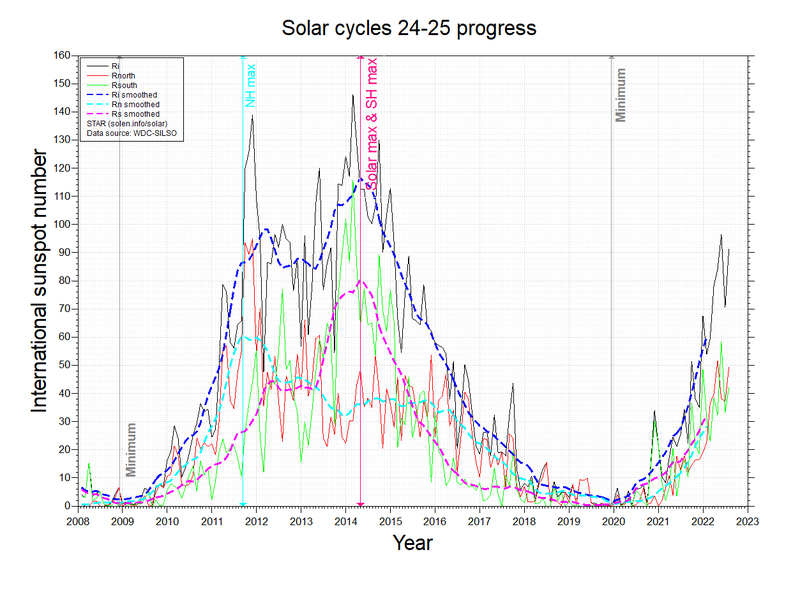 January 22-24: No obviously Earth directed CMEs were observed in available LASCO imagery. 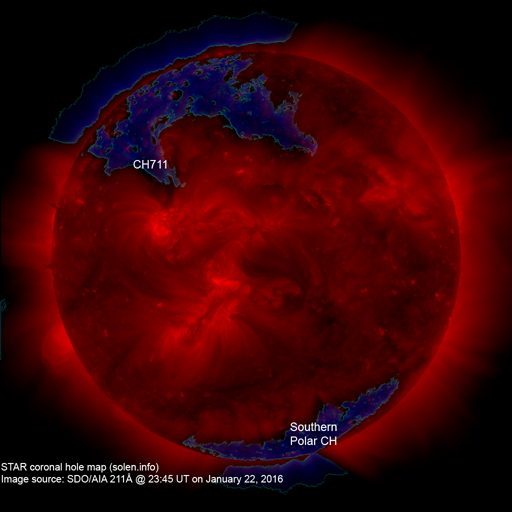 The geomagnetic field is expected to be mostly quiet on January 25-27. On January 28-29 there is a chance of unsettled to active conditions due to effects from CH711.